Fingerpainter Michael Ives has been invited to speak and showcase his work at 3 Apple locations throughout the Tucson and Phoenix areas this week. He’s also been invited to present his work to a regional MacIntosh users group. 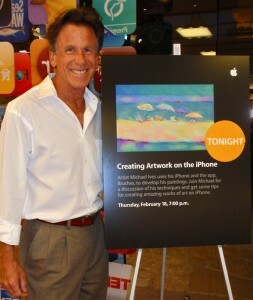 “Michael iVes, iPhone Artist” is a discussion about the artist’s personal journey with the medium, the value and validity of using technology in art and how fingerpainting on the iPhone can enrich the lives of both professional and novice artists. Ives has already completed three successful sessions including one at the La Encantada Store Mall in Tucson Arizona on February 18th and the other just last night at the Apple Store at San Tan Village in Gilbert. So far, the audiences have been pretty diverse, ranging from professional visual artists, mac enthusiasts and staff to the curious customer and/or passerby. During the sessions Ives shares his experiences with the iphone as an art tool and walks the group through his own unique journey–his discovery of the medium, how it has enriched his life both personally and as a professional artist and marketing his works. He also discusses the ease in which he can print and display his art. Ives shares his experiences and perspective on fingerpainting. The talk also features video replays of two pieces, “Movie Night” and “A Summer Day” and a large framed print. He shares the group’s general reaction, “I had the impression by their reaction as they viewed my videos…that it was like walking an alien into the room; it’s something no one has seen before, something magic.” Well, I must say, your work is pretty stunning too, Michael! 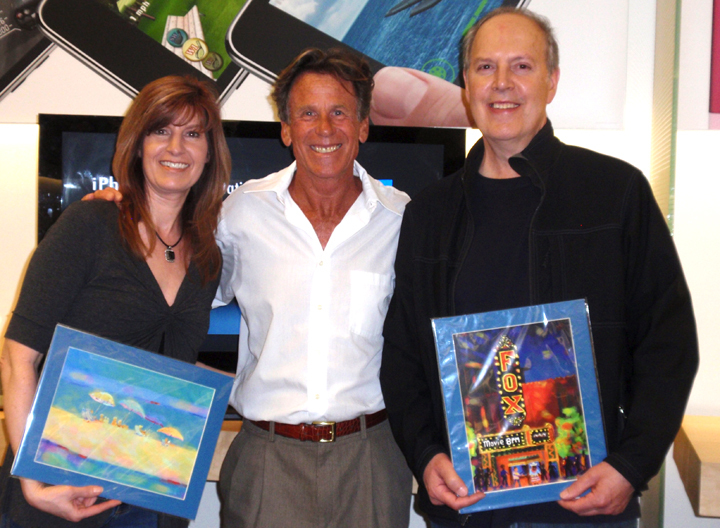 Ives even awards two lucky "Door Prize" winners with framed prints of his work. Michael Ives’ final speaking engagement is at the Biltmore Apple Store in Phoenix today at 12pm MST. If you can make it, you most definitely should stop by! For those who can’t make it, no worries! You can learn more about the artist by viewing his website, www.ivesart.com, or checking out his fantastic stream of work on Flickr. 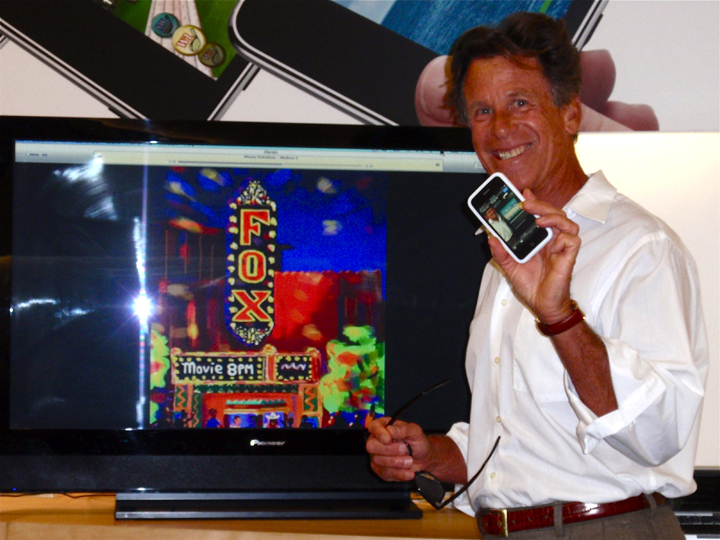 Ives poses with "Movie Night" display. Are you sharing your iPhone art or fingerpaintings with your community? Let us know how! This entry was posted on Saturday, February 20th, 2010 at 19:47and is filed under . You can follow any responses to this entry through the RSS 2.0 feed. You can leave a response, or trackback from your own site. 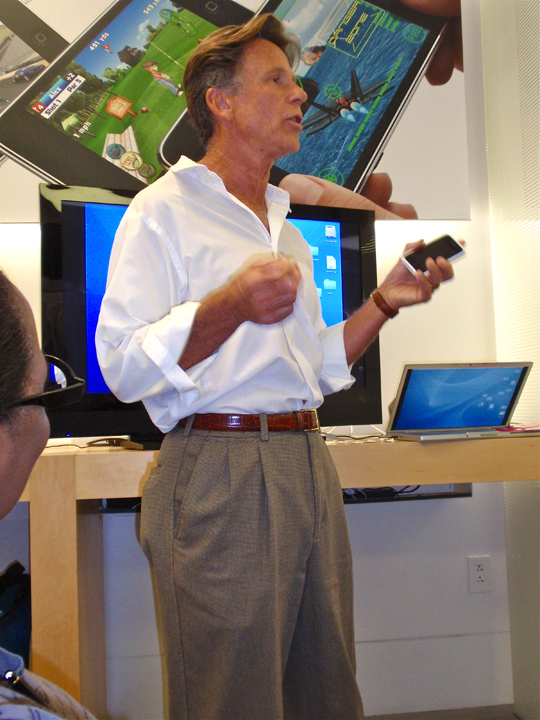 Thanks for the nice review of my iPhone art and of my speaking events experience these last few days. It was a load of fun and I think many people that were in the audiences will be joining us as iPhone/brushes artists soon! Congratulations Michael, you have found a cutting edge niche that will inspire many people. I hope to see you on tour throughout the world! How wonderful of apple to showcase your talent and embrace your creations. All the best to you. Congratulations Michael! Thanks for sharing! Superb article Mia. It was an exciting time and a lot of fun to show ‘brushes’ to the public. And with Mia’s writing the article it is brought to life all the more. Great to hear, Michael, that your talent extends beyond creating dazzling fingerpaintings, but having the patience to teach it as well …. Double plus good! Mia… I’m really blown away by your writing, and yea again Double Plus Good!